Cracked base. Sometimes the crack is hard to see, sometimes you can't miss it like this one. This is the High Pressure Filter Port that is bulged and cracked. There is no fix other than replacing the Sump Base. This happens when water is allowed to freeze inside the pump. This is why it is important to change your fluid once a year at least. A typical sign that this is cracked in this place is that when using the E-47 plow pump, oil leaks out in between the PA Block and the Sump Base. Often people think it is a valve leaking. Valves very rarely leak. We have seen dozens of cracked Sump Bases. Broken Crossover Relief Valve Spring. This typically happens when the spring is rusty and fatigued. One good hit and the spring shatters. For whatever reason, the spring stopped getting oil, or got a water and oil mix that caused it to rust. Another possibility is lack of use in that the Crossover Relief Valve did not open for a long time. This is all Meyer offers now. It replaced the multiple piece adjustable Crossover Relief Valve. Fits E-47/57/58/60 units. Here is a favorite of mine. a pink plastic baffle. 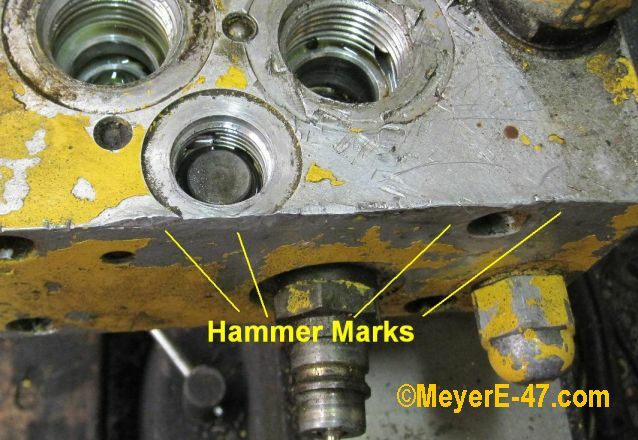 This happens when ATF (Automatic Transmission Fluid) is put in the pump in place of Meyer M-1 Hydraulic Oil. Obviously the color does not affect operation, but knowing that the unit had ATF in it makes you wonder what other shortcuts or cheap fixes that unit has undergone over the years. ATF is NOT what you want to use. It has detergent in it, and Type F is actually abrasive. ATF contains no anti-icers like M-1. White Plastic Baffle for E-47/57 Meyer plow pumps. Mounts on Tank Studs with included Retaining Washers. Baffle P/N 15621, Retaining Washers P/N 21980. Older units do not have this Baffle. This kit can be installed in older units. Typical scenario. You need to plow, and your pump is not working. Either it is suggested, your idea, a last ditch effort, whatever. You can destroy it. It will only take one hit in the right place, and then you will need a new PA Block. The PA Block is THE most expensive part of the unit. Keep in mind in the above pic that the Male Coupler coming out of the right side of the PA Block does come out on an angle, that is normal. See how the block is crushed in right next to the hex nut where the line is pointing? Here is another view. You can see how peened over the corner of the PA Block is. Here is a closer look. You can also see that the C Valve was swollen bad, and someone had a hard time getting it out, and gouged the PA Block in the process. We had a hard time getting the new one out too, it was swollen and the coil came out with it. In the owner's defense, he bought this used. Now you can see what the damage affected the most. 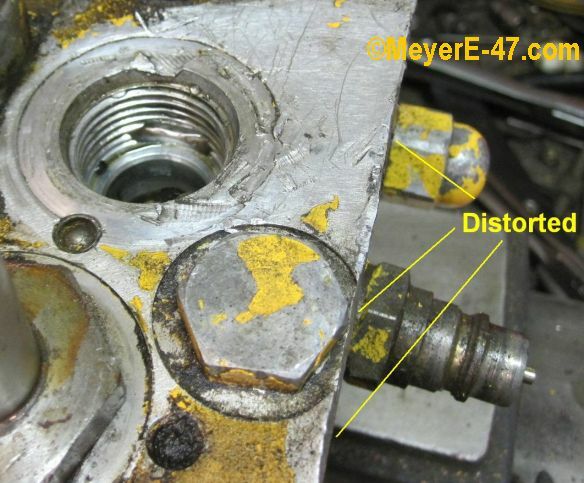 With the hex nut removed (the Pilot Check Piston Plug) you can now see the Pilot Check Piston sitting in its bore. Well it is stuck, because the bore is distorted. The wall of the PA Block is thin on the outside of the bore, and the hammer blows crushed the bore. 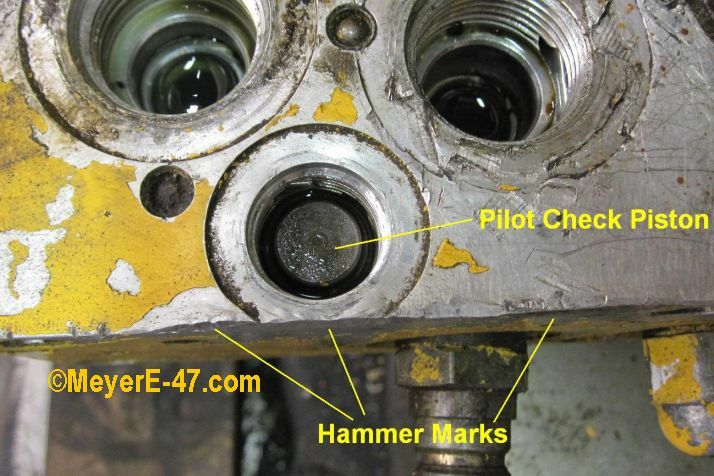 The Pilot Check Piston must be able to move freely up and down in its bore. Another view of the damage caused by the hammer. The above pictured PA Block is OBSOLETE. 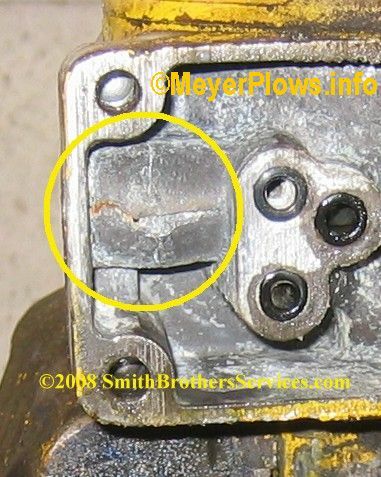 A somewhat common problem we find when rebuilding Meyer E-47, E-57, and E-60 plow pumps is the bolts holding the PA Block to the Sump Base are stripped. Not the thread portion, but rather the Allen head of the bolts. While these bolts are not torqued super tight during assembly, they can be tough to get loose due to galvanic corrosion. The galvanic corrosion occurs due to dissimilar metals being put together. In other words, a steel bolt is threaded into the aluminum casting that is also used as a ground for the electric motor. 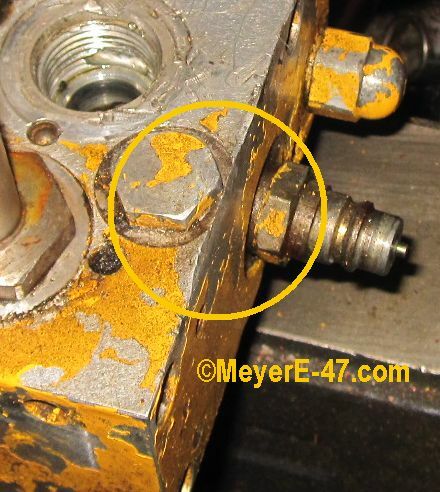 What we find is that the heads of the PA Block Bolts tend to corrode far more than the thread portion of the bolts. 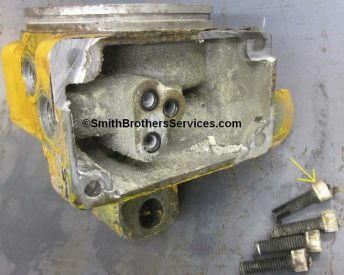 Years ago I went as far as going to a machine shop next door, and having the heads milled off the bolts, thinking the block would come right off. Nope. We still had to beat the block loose with a rawhide mallet, and it put up a good fight! The corrosion on the heads of these bolts wedges them tight in the cavities. 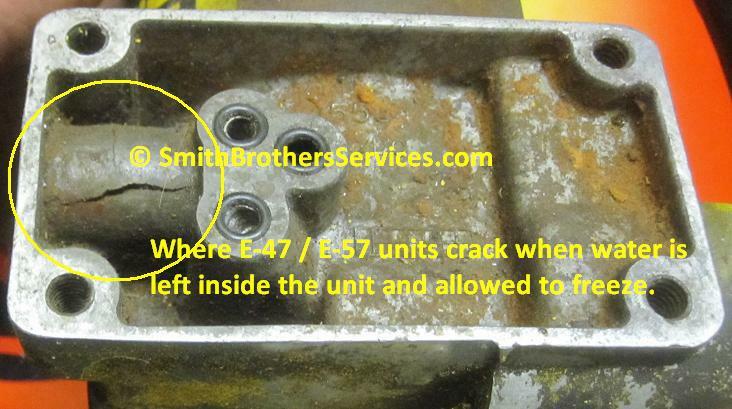 The most important thing to keep in mind is that the E-47/E-57 (and E-60) Sump Bases are still available. The PA Block is not available new from Meyer. You would have to buy their latest PA Block (which will bolt right on) for $800+. On top of that you would need a wiring adapter because the E-58 style PA Block has 2 wire coils with Deutsch connectors, and the old style has single wire coils with bullet connectors. You would also need hose adapters because the E-58 PA Block has different threads in the hose ports (SAE vs. NPT). We currently sell the E-47 / E-57 Sump Base for $127. The E-60 we sell for $179. Personally I would buy a rebuilt or used unit before I would spend $800 on a part. The above Sump Base was damaged during a previous rebuild (don't know the history, the base was cast in 1984) so we had to get the PA Block off to put on the new Sump Base. We used a cut off wheel on an angle grinder to cut through the PA Block Bolts being careful not to gouge or damage the PA Block itself. When we rebuild pumps in our shop, we always try to remove the PA Block, but, if the bolts seem like they are going to strip then we leave the PA Block on. Why? Because it is not imperative that it be removed during a rebuild. The only benefits to removing it during a rebuild are that you can change those 3 little O Rings you can see in the pic, and it will be easier to remove the bolts again at a later date. 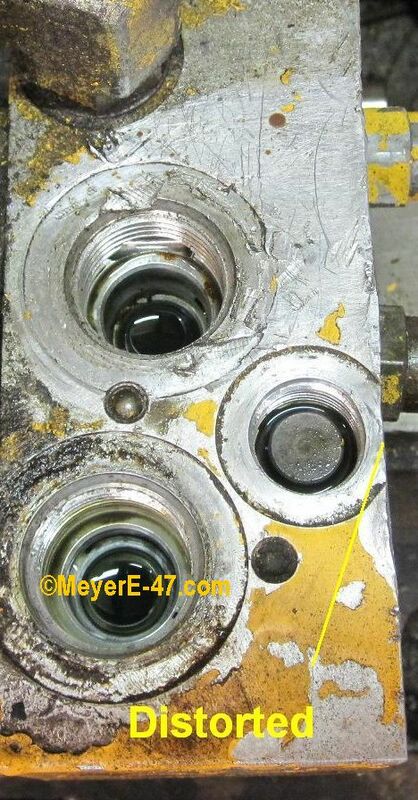 I have never seen one of those little O Rings in the above pic blow out, or leak, unless somehow the PA Block Bolts came loose, and if that is the case, then there is no problem getting the bolts out. A reason to have to remove the PA Block would be to inspect it for cracks in the filter port casting, which would be indicated by a pretty severe fluid leak between the Sump Base and the PA Block. When that is the case (severe leak) 90% of the time the Sump Base is cracked, and needs to be replaced anyway. The other 10% of the time the leak is due to one of the steel balls that are pressed in after drilling the passageways in the PA Block blowing out. The best preventative measure we have found that helps is applying a liberal coating of Neverseize to the PA Block Bolts. The ENTIRE BOLT. Another step you can take is from time to time (twice a year) spray Fluid Film liberally into the 4 cavities in the PA Block where the PA Block Bolts are. As far as getting out the stripped bolts, we have tried heat (aluminum is an awesome heat sink) which just wasted gas and time. We tried pounding a Torx bit into the bolts with no luck. Tried using a "hand ground to fit" Metric Hex bit with no luck. Not only is stripping the head of the bolts a concern, so is breaking the Hex bit when trying to remove stubborn bolts. When it comes to hand tools, we use mostly cheap tools, but when it comes to Hex bits for this application, we use well known professional brands (you won't find at a big box store) only. A T handle Allen key will not be enough to get these bolts out if they are corroded. 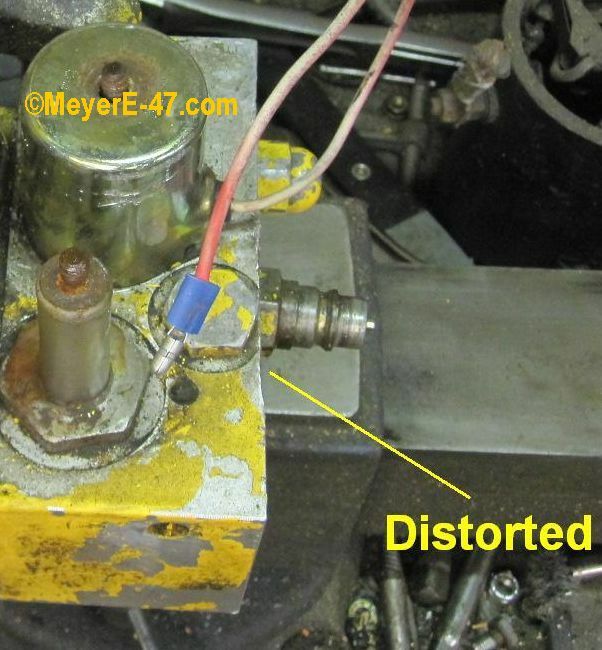 Meyer E-47 and E-57 Sump Base. Meyer part#15573. Replace your damaged or cracked base with this new OEM Meyer part. Comes with Drain Plug, Filter Plugs, and Filters. We will add A LOT more to this page as time allows. 7-11-17 Common E-47 Problems Two more pages added.